A full size driving range suitable for even the longest of hitters. The driving range, just a short walk from the car park, is situated adjacent to the 18th hole. It is one of the finest in the area and even the longest hitter can pull out the driver and see the ball head off and land with plenty of room to spare. There is a well maintained short game area to the left side of the range consisting of a chipping green and surrounding bunkers - perfect for honing your pitching, chipping and bunker skills. 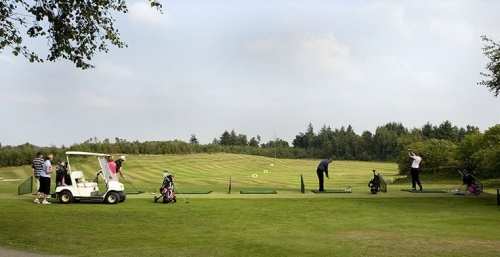 Our facilities are perfectly suited for those wishing to learn to play golf. We have a membership category 'Intro to Golf' that provides access to the Clubhouse and all of our practice facilities. 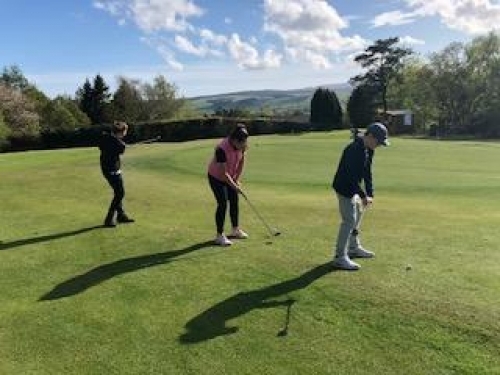 Our resident PGA professionals run regular golf clinics throughout the year, making Kilmacolm Golf Club the ideal place to learn to play the game. The range utilises high quality mats which provide a durable and consistent surface to hit from all year round. Tokens for the ball dispenser can be purchased from the Pro Shop or bar. In addition to the driving range and pitching facilities, there are two putting greens in front of the clubhouse and next to the first tee to practice on or warm up before play.